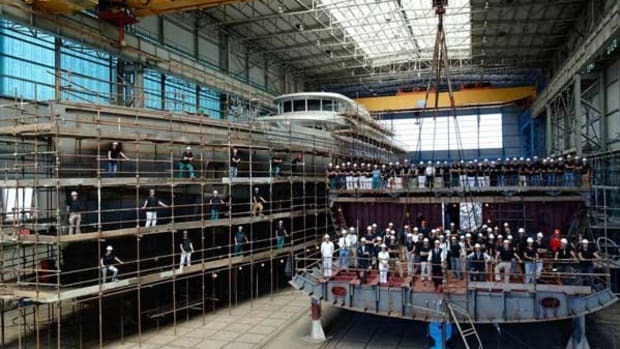 Benetti recently launched its 354-foot (108-meter) motoryacht Project FB275. 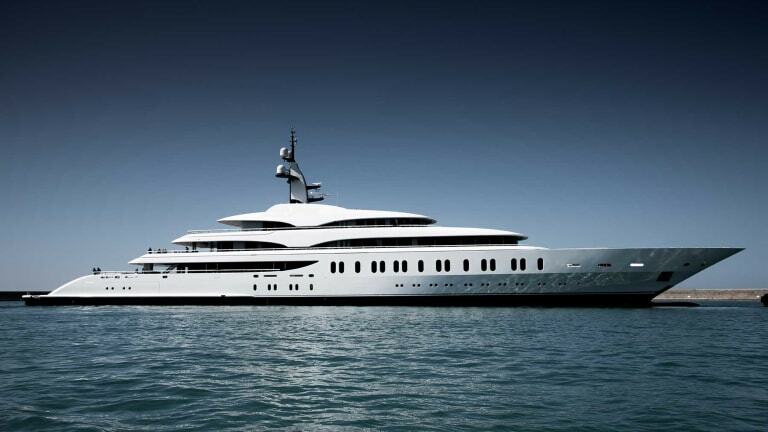 She has a beam of 47 feet (14.5 meters) and a 14-foot (4.4-meter) draft. 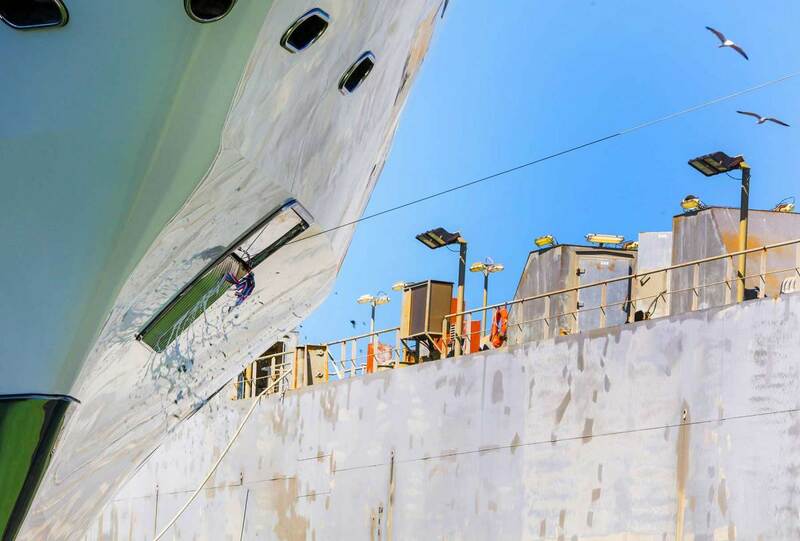 With her steel hull and aluminum superstructure, her displacement is 4,032 tons. Created for long distance cruising, FB275 has a fuel tank capacity of 91,140 gallons (345,000 liters), enabling her to achieve a range of 6,500 nautical miles at 14 knots. 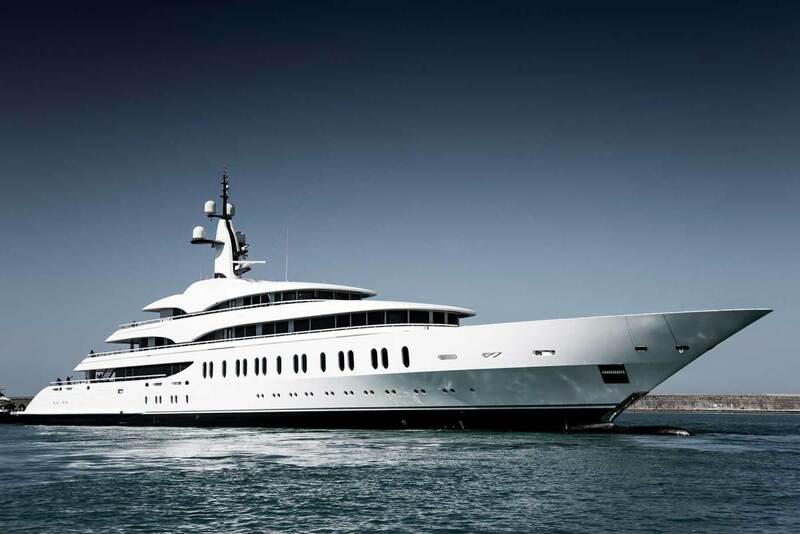 British design studio RWD designed her exterior lines and Benetti’s in-house team created the interior. More than 10,764 square feet (1,000 square meters) have been devoted to exterior spaces spread across five decks. 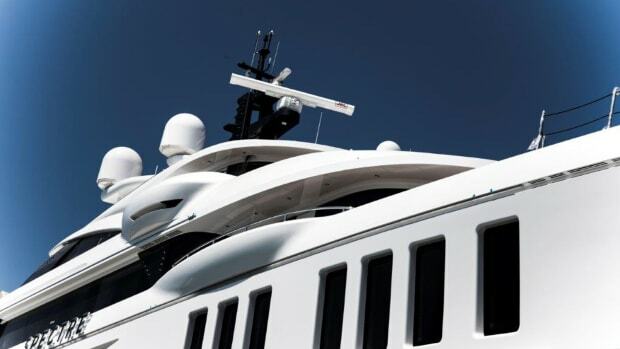 The Observation Deck at the very top of the yacht offers panoramic views and circular social seating. On the Bridge Deck two L-shaped sun pads are set around a firepit. The Owner’s Deck has its own exclusive dining and seating areas, and on the Main Deck there are a large dining table and more intimate seating groups as well as a heated swimming pool. 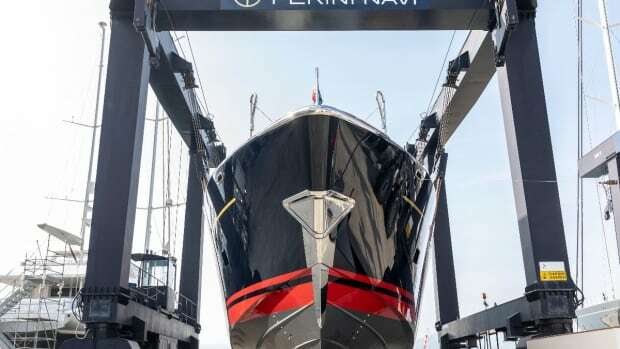 Two 46-foot (14-meter) tenders are stowed on the foredeck. Another customized 33-foot (10-meter) tender will be stowed in the yacht’s garage on the Lower Deck, alongside up to 8 maxi jet skis. FB275 also features a 397-gallon (1,500- liter) gas refueling station for all the toys on board. 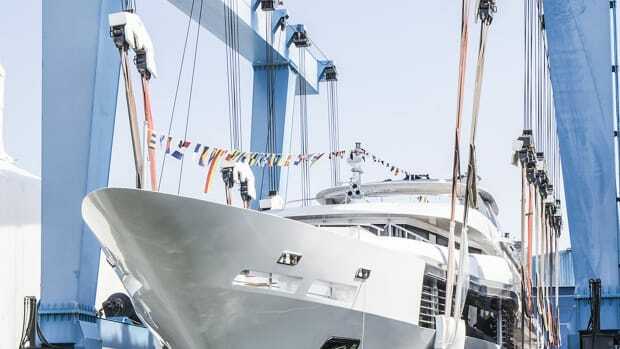 The yacht is equipped with five cranes and two special hydraulic scissor-type lifts for lifting tenders up to 16.8 tons. 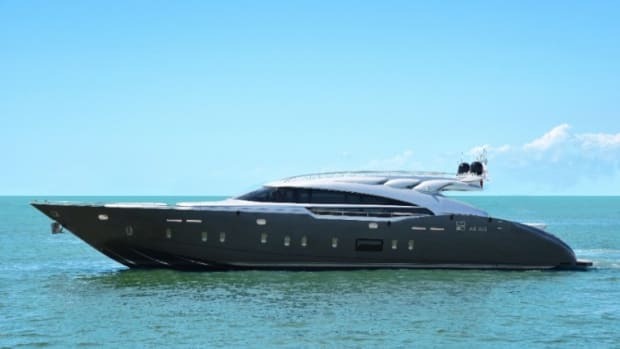 The yacht also features a cinema, a gym with sauna and a drop-down balcony. 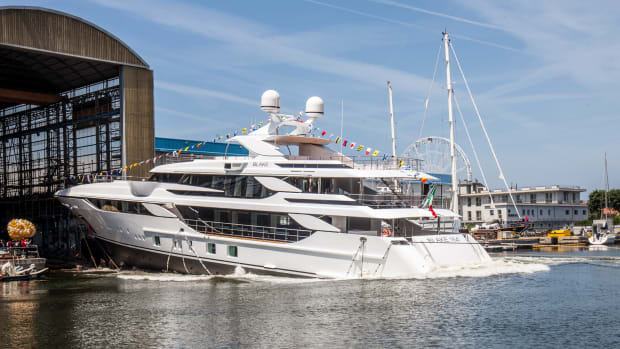 The yacht’s main propulsion comes from two MTU diesel engines rated at 2880 kW each, enabling a maximum speed of around 18.5 knots. The main gensets are four CAT C18s rated at 465 kW. 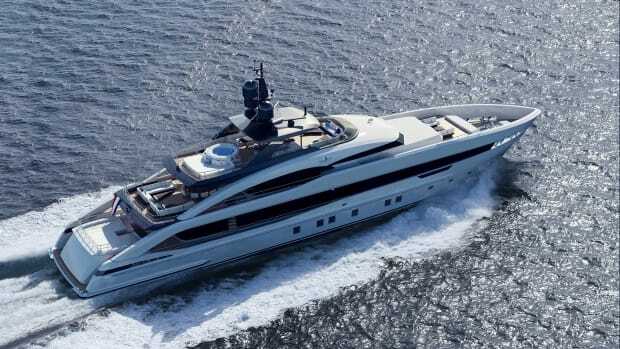 FB275’s impressive environmental credentials are, in part, due to an electric Schottel stern SPJ pump jet with 500 kW power, which gives outstanding maneuverability as well as enabling the yacht to travel for short distances under entirely electric propulsion. 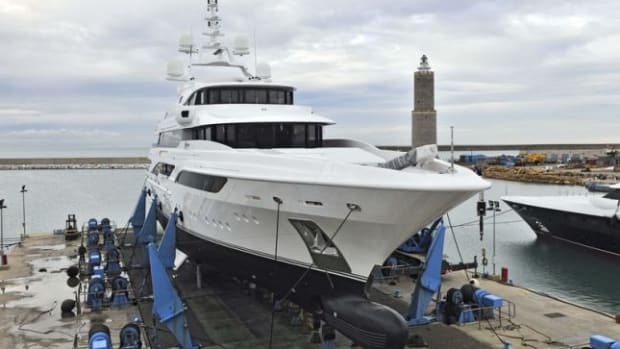 FB275 is also equipped with two Rolls Royce variable-pitch bow thrusters rated 200 kW each, which are integrated with the stern thruster with a DP system interface realized by Rolls Royce. The stabilizer system is completed with four fins supplied by Naiad-dynamics. 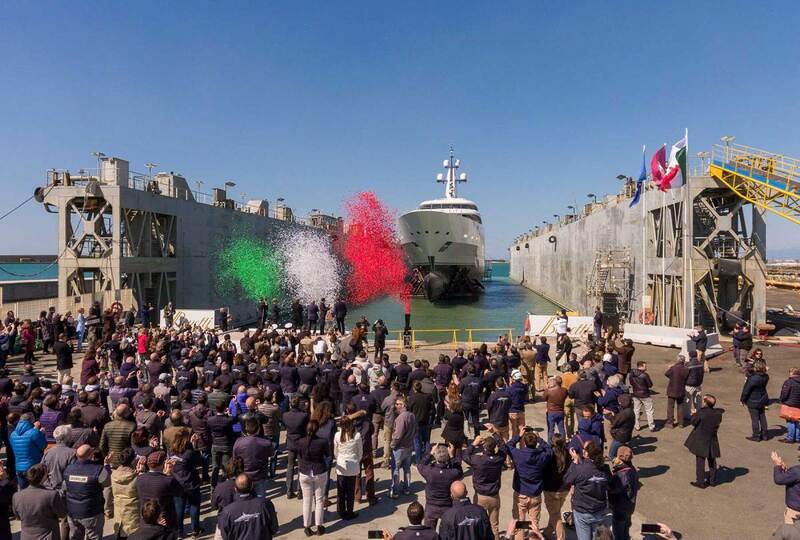 Expansion at the Livorno shipyard in the form of two new- generation steel sheds has enabled Benetti to greatly increase its productivity. The sheds are each of 192 feet X 450 feet (58.5 x 137 meters) and a height of 100 feet (30.4 meters), and both are equipped with two gantry cranes with a maximum capacity of 45 tons. 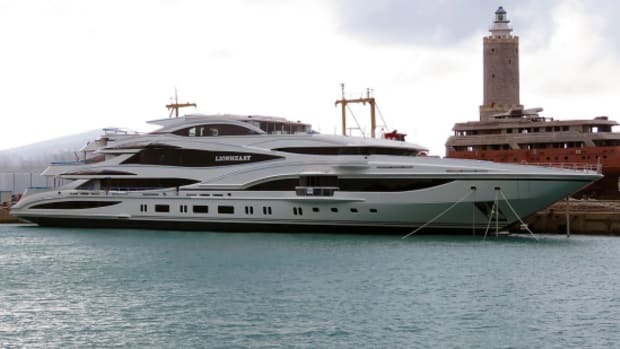 The program enabled Benetti to build three Giga yachts simultaneously. 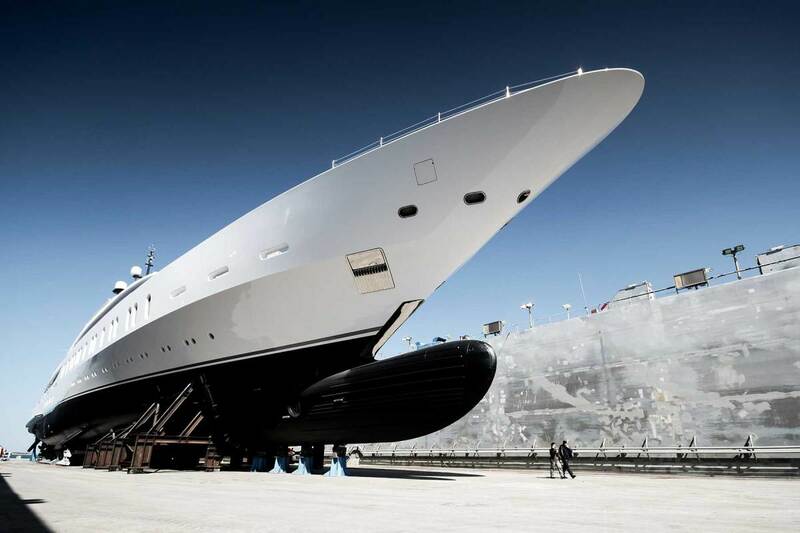 Last December, 351-foot (107-meter) FB277 was launched, followed in February by FB272, another over 328 feet) 100 meter yacht, and now, completing this trilogy of staggering yachts, 328 feet (108-meter) FB275 has been launched.